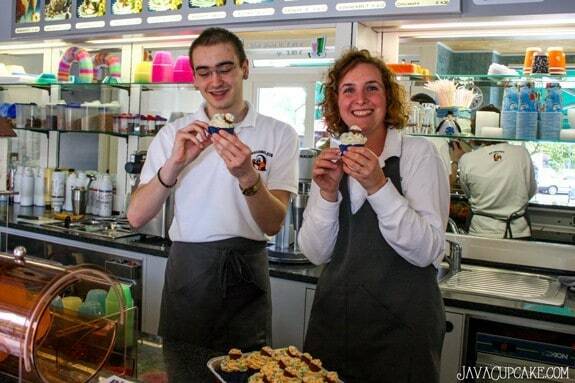 Nestled in a quiet military community in Bavaria, Germany Pinguino Eis, an Italian Gelato Cafe, serves homemade gelato treats to ice cream loving Americans, Germans and their families. 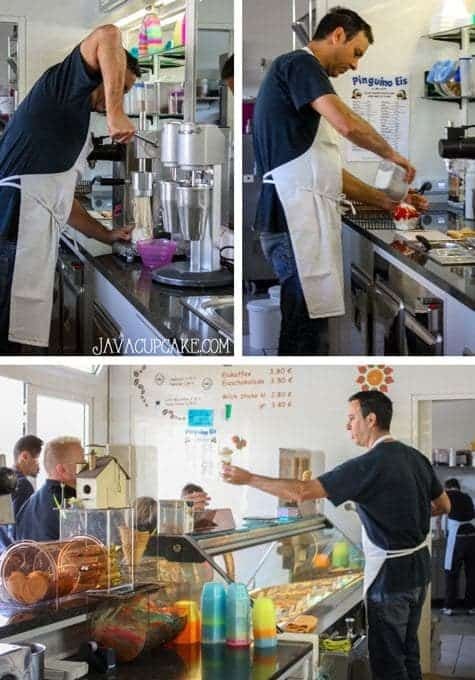 A few weeks ago, I was given the privilege of taking a behind-the-scenes look at what it takes to run this authentic Italian gelato cafe and the process of making their delicious gelato! Upon entering Pinguino Eis, I’m often greeted by the owner Phillipe (right) and Luca (left), his lone trusted employee. Sometimes, Phillipe’s co-owner Ariana is in the store too but most of the time it’s these guys. When I first started going to Pinguino Eis in March of 2011, I knew from my first scoop that this gelato cafe was a special place. I didn’t know it then, but Phillipe speaks at least 6 languages including German, English, Spanish and Italian. No wonder he was so inviting and friendly when we walked in the store… he was ready for whatever language we spoke! During the winter months, Luca goes back to Italy where he lives and Phillipe & Ariana enjoy time off with their two sons. This year, instead of going back to Italy though, Phillipe & Ariana said they’re staying in Germany for the winter. Should be a fun winter for them, Phillipe is originally from Luxembourg and is no stranger to cold winters! 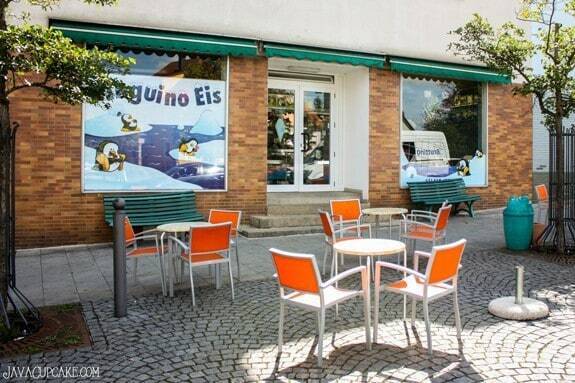 Since Pinguino Eis is only open during the warmer month’s of the year (March to September), they have just a few tables inside for their customers to enjoy their gelato. Most of the seats are outside where umbrellas for shade keep their patrons cool on hot days. It’s not uncommon to see dozen of people lined up at the door to get in and dozens more sitting and standing outside during the summer months. Inside the store, immediately you notice their freezer display full of at least 20 different gelato flavors to choose from. Everything from chocolate, strawberry and vanilla to more fun flavors like forest berries, rum raisin and bubble gum. There’s something for everyone! Let’s get to the good stuff… the gelato! Since I grew up eating American style ice cream, it wasn’t until I moved to Europe that I was introduced to gelato. There are 2 major difference between American ice cream and gelato. First is the ingredients. American ice cream tends to have a lot of preservatives and extras added into the mixture before it’s churned. Geltao doesn’t. The gelato that Phillipe makes using recipes he created over 15 years of experience in the gelato business has very few ingredients. Sugar, dextrose, cream and flavoring. That flavoring is always as fresh or as natural as he can get it. Real fruit, real nuts, real everything. This is why gelato has a shelf life of only 3-4 days. Luckily, it doesn’t ever last that long and Phillipe’s gelato never goes to waste. 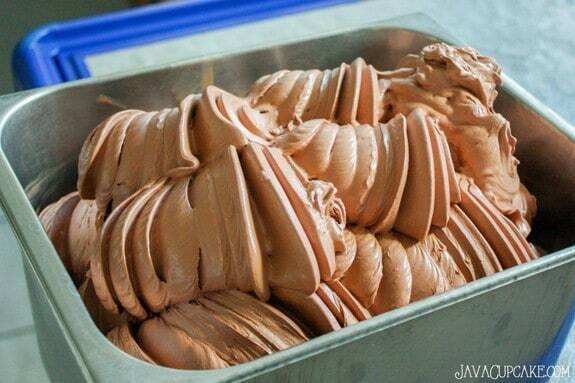 The second difference is the process in which the gelato is made. American ice cream ingredients are mixed and then immediately put into an ice cream machine to churn and freeze. 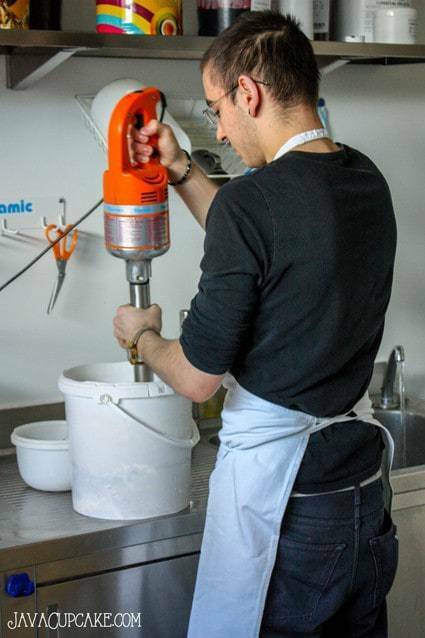 Gelato has an added step of cooking the cream mixture before churning and freezing. This added step helps to break down the sugars and cream making the smoothest, creamiest gelato. I learned that making authentic Italian gelato is a lot easier than I imagined. I assumed it was a more intensive process with a lot of mixing, ingredients and steps. But, really it’s very simple. 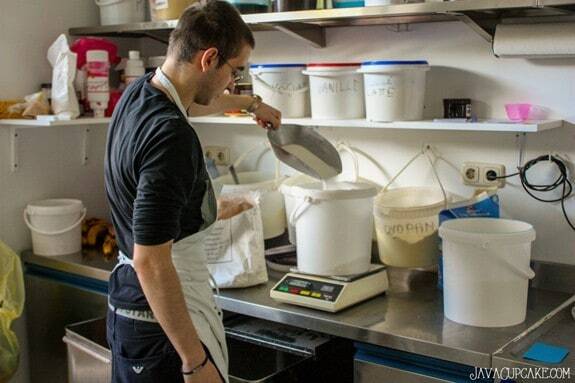 First, Luca starts by measuring the ingredients into a large bucket. This is the base of the gelato. He adds any flavoring necessary then uses a large immersion blender to mix it all together. 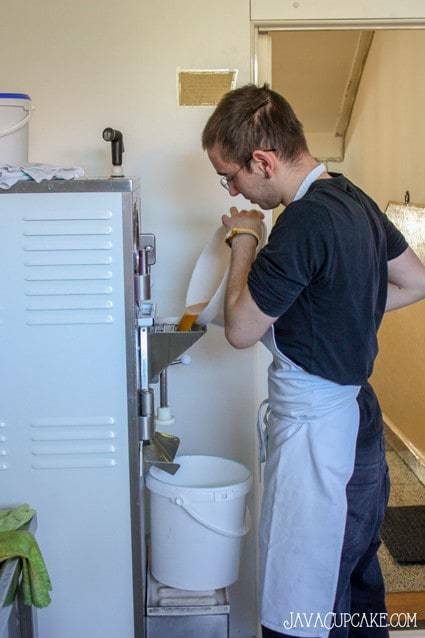 Next, the mixture is poured carefully into the top section of the gelato machine where it cooks for 7-8 minutes. (This machine, by the way, is an investment! Phillipe told me they cost around €30,000! Yikes!) The mixture is then transferred by a spout to the bottom of the machine where it freezes and churns for 10-15 minutes, depending on the size of the batch. Finally, a small door is opened and the freshly made gelato comes out and falls into a pre-frozen metal pan. The gelato is immediately placed in their case to serve to their loyal customers! Are you as surprised as I am at how easy this process was? In the two hours I was at Pinguino Eis, I saw Luca and Phillipe make at least 6 flavors of gelato including the truffle in this picture, coconut and mango! 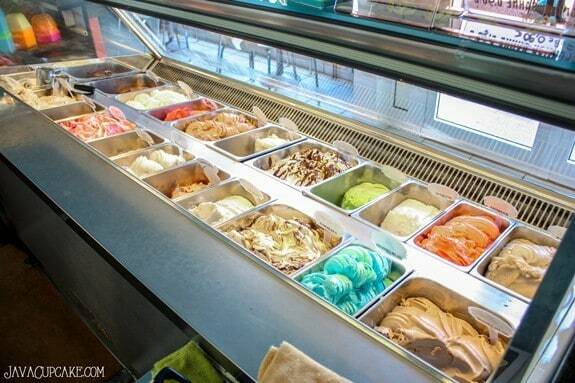 Gelato can be served in various different ways. In a bowl, on a cone or even as spaghetti! In Germany, gelato is called Eis and at Pinguino one of the most popular desserts is Spaghetti Eis! 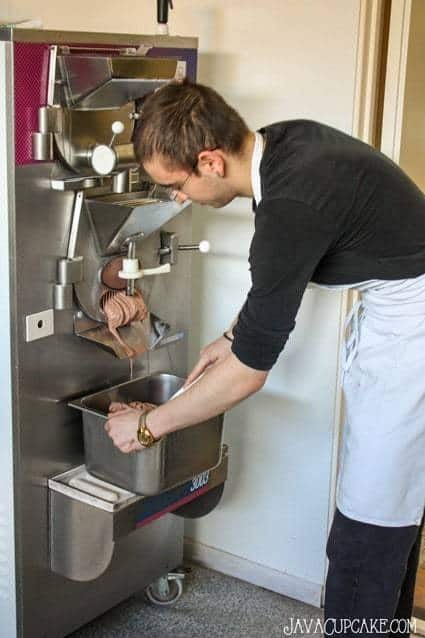 It starts with pressing vanilla gelato through a press that has dozens of small holes at the end so that the the gelato comes out like strings of pasta into a bowl. A berry sauce with tiny little berries like meatballs tops the spaghetti Eis along with whipped cream and white chocolate shavings like cheese! My favorite flavor of gelato at Pinguino Eis is the red currant or Johannisbeeren. It’s what sparked my obsession with the little red berries and inspired me to feature the red currant on my blog for Red Currant Week! If you follow me on Instagram, you may have seen the MANY posts of the gelato I’ve consumed at Pinguino Eis! Check search for hashtag #PinguinoEis! During my visit with Luca and Phillipe, Luca mentioned to me that Ariana asked if I could make them some cupcakes! Of course I said ABSOLUTELY! Come to find out, none of them had ever had a cupcake before. Luca requested chocolate & peanut butter… his favorite combination. Too easy! 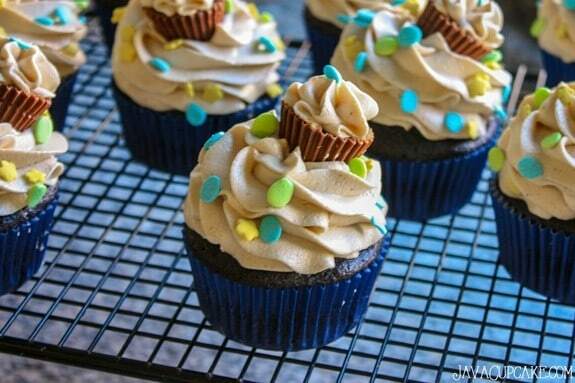 I whipped up some chocolate cupcakes and topped them with my perfect peanut butter buttercream then garnished with a mini Reese’s peanut butter cup dressed up in frosting like a mini cupcake. I brought the cupcakes to Luca and Ariana and before I could even snap the picture, Luca was digging in! The cupcakes got rave reviews and Ariana couldn’t believe how smooth and light the peanut butter buttercream was. She commented on how she had tried peanut butter before, but it was always too thick for her but that this frosting was amazing! 🙂 Yay! I think we have a few new cupcake lovers in the world now! 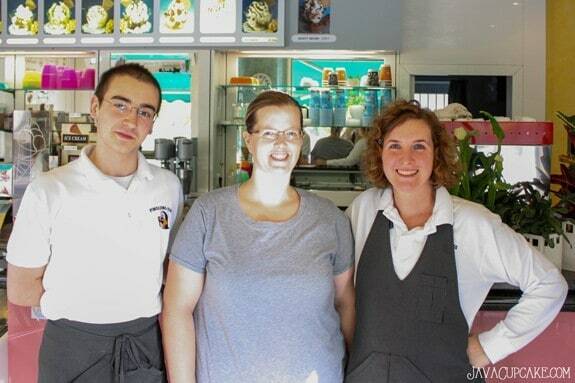 A big THANK YOU to Phillipe, Ariana and Luca for welcoming me into Pinguino Eis! (Don’t laugh at how horrible I look in this picture!) This was truly an amazing, once in a lifetime experience for me that I will cherish always. To be able to learn to make gelato from people who truly are authentic to the business was truly an honor. I am so blessed to have met you all and hope that we can remain friends and keep in touch for a lifetime! Come back tomorrow, I’ll be sharing an amazing ice cream coffee drink that I first had at Pinguino… but this one I made at home! awww how sweet! 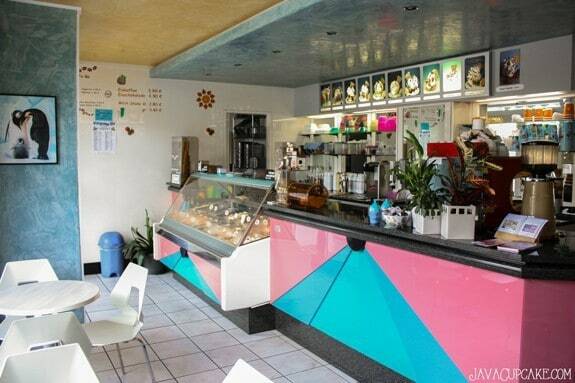 love how you fostered a relationship with these guys and the gelato looks amazing!!! Thanks for the feedback. Maybe I should have prefaced this info in my post with “In my experience, the differences are…”. The machine that Pinguino Eis used did both, cooking and freezing the ice cream, two machines were not needed! Also, his ingredients were as fresh as possible… no added coloring was used. I saw this first hand while helping them make may of their flavors. As for American ice creams, every ice cream I’ve ever made at home required no cooking! I’m sure there are some American ice cream makers that do cook their mixture, but I never have. 🙂 Thanks again for being a loyal follower and I appreciate the feedback! Hi Betsy! Didn’t pay attention to the fact you live in Germany–I do too! I’m in Wiesbaden! Glad you had that wonderful experience. It’s just something about that gelato! I can’t eat American ice cream..upsets my tummy. But gelato–I can eat it all day and never get sick! 🙂 Keep doing what you’re doing! I enjoy following you!